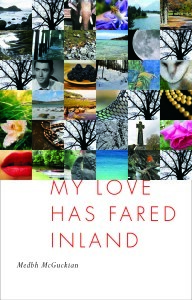 According to a review by Borbala Farago in The Irish University Review, Medbh McGuckian’s My Love Has Fared Inland takes up “familiar themes of creativity and spirituality” and the poems “trace an introspective trajectory” including themes of “death, writing, nature, and love.” Due to the diverse content of the book, it was important for Wake Forest University Press to capture the essence of the poetry and mirror the book’s themes through the cover art. Because Wake Forest Press is an integral part of the university, it seems only fitting for the Press to try and integrate the creativity of Wake’s students within the innovative process. So, the Press held a contest in which students could submit personal photographs depicting and representing their own introspective trajectories to be chosen for the cover—a chance at immortality, in other words. The Press chose a number of entries that emphasize the experimental, imagistic quality of the poetry. The interplay between the cover and the poems provides a tangible touchstone for McGuckian’s often esoteric language.